The Pilgrimgram: Focus on What we're For. Instead of focusing on what we're AGAINST, maybe we focus on what we are FOR? Instead of focusing on warning people against "wolves in sheep's clothing," I propose that we focus our attention and our affection on the Shepherd. First, it's easier to keep track of: there's only ONE God to be FOR. There are too many more wolves out there, and they keep swapping their sheepskins, so you have to kind of study their evil to know what evil they're representing this week. Ick. Second, we become like that which we focus on. 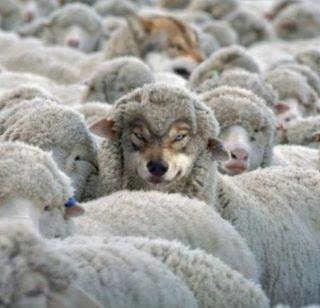 I'd much rather be like Jesus than like the guys that people are warning us about, the wolves in sheep’s clothing. If I focus on the wolves, I become wolflike. Ick again. No, we aren't ignorant of them, but we don't squander our attention or our conversation on them. 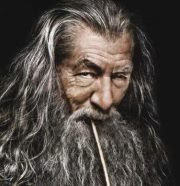 Third, if I train people to pay attention to my warnings, or the warnings of others like me, then I am drawing their attention and their devotion away from where it ought to be. Believers in Christ ought to be following Christ, not other believers, and I don't want to be the one who has to answer Him for why His Bride is turning away from Him and following me. Yikes. Fourth, if I feel the need to constantly be warning the sheep about wolves, then I have seriously underestimated the sheep. 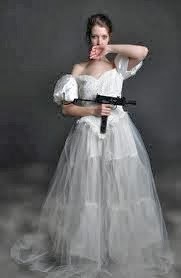 We think of the Bride in white lace, but this one has a ka-bar straped to each boot, and instead of flowers, she’s carrying an automatic weapon in her hands. This sheep is not without formidable resources. Fifth, we're commanded to focus on the good stuff. Philippians 4:8 is pretty clear. Hebrews 12:1&2 tells us where to fix our attention. This is a WAY better (and WAY more useful) focus of our attention than the wolflike bad guys. Sixth, we are NOT the only ones out there working to protect innocents from wolflike bad guys. If we act like that's our job, then we are completely disrespecting the Holy Spirit and the angels of God. It is not our job to do His job. Seventh and finally, the power of God in us is orders of magnitude greater than the power of evil. Jesus kept messing with that one. In the old covenant, a good guy touching a bad guy polluted the good guy, and this is what many of today's warnings are about. But in the Kingdom, a good guy touching a bad guy brings healing to the bad guy: lepers, demoniac, even corpses! Honestly, any ONE of these is enough reason to put our attention on bigger and better things. All of them together are overwhelming.